I love it when the house is full of flowers! I managed to glean 5 vased arrangements from about $38 in grocery store flowers (see the first one and all the details here). 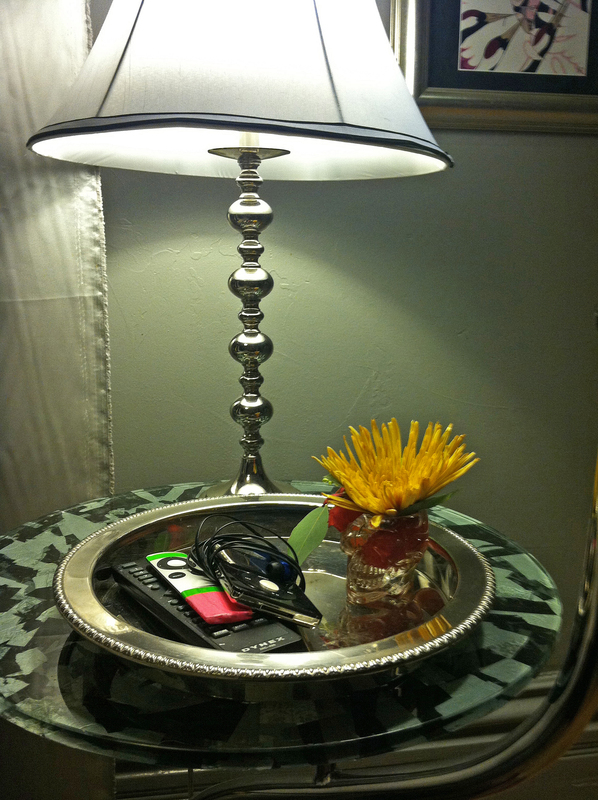 One large centerpiece, one medium for the bedroom dresser, one smallish one for the coffee table, and two tiny ones, one for each nightstand. 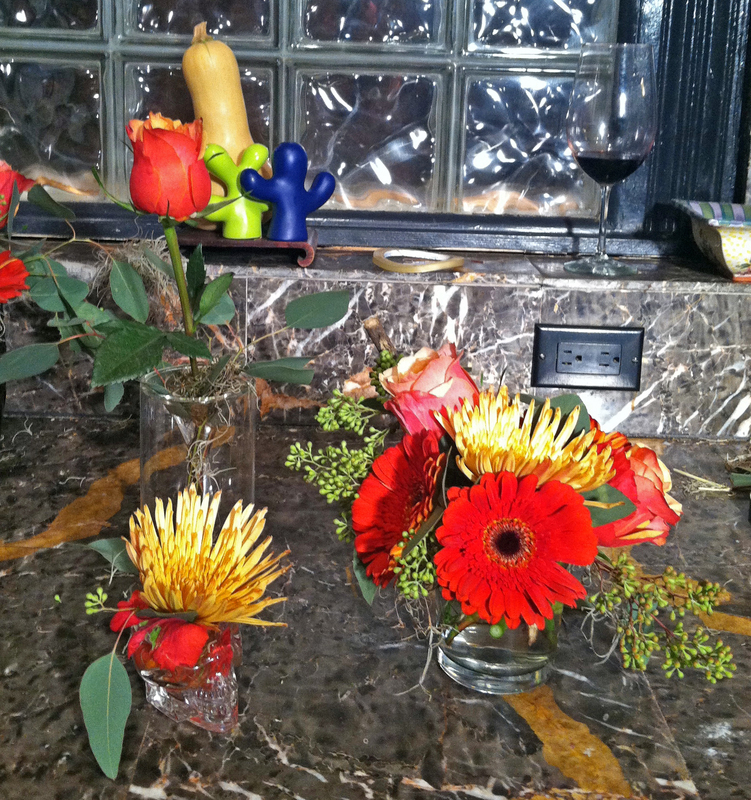 Yesterday I showed you the big centerpiece arrangement I did for the dining room table, and as promised here are the other four. 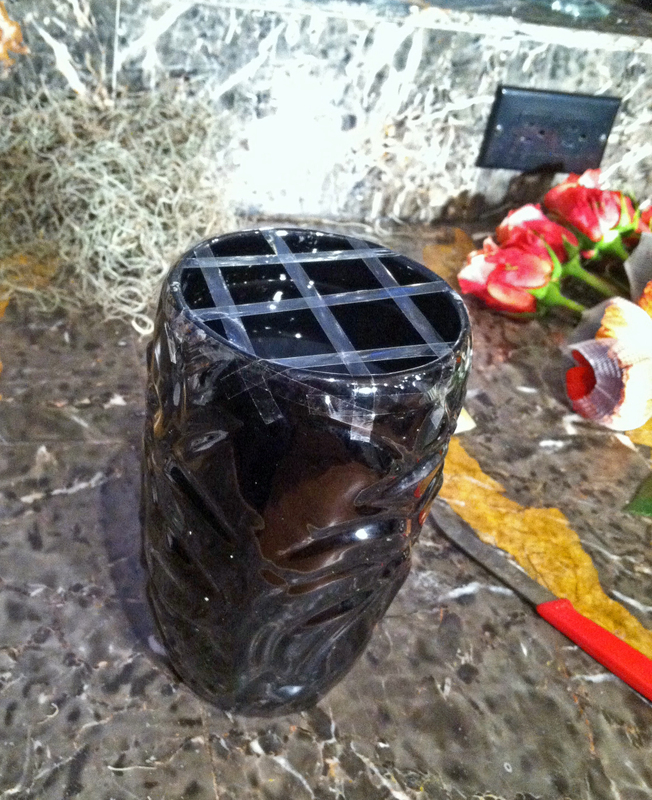 We’ll start with the medium vase for the bedroom dresser. As I said in yesterday’s post, getting creative is the key. Unusual containers and interesting add-on’s (sticks, fruit, etc.) 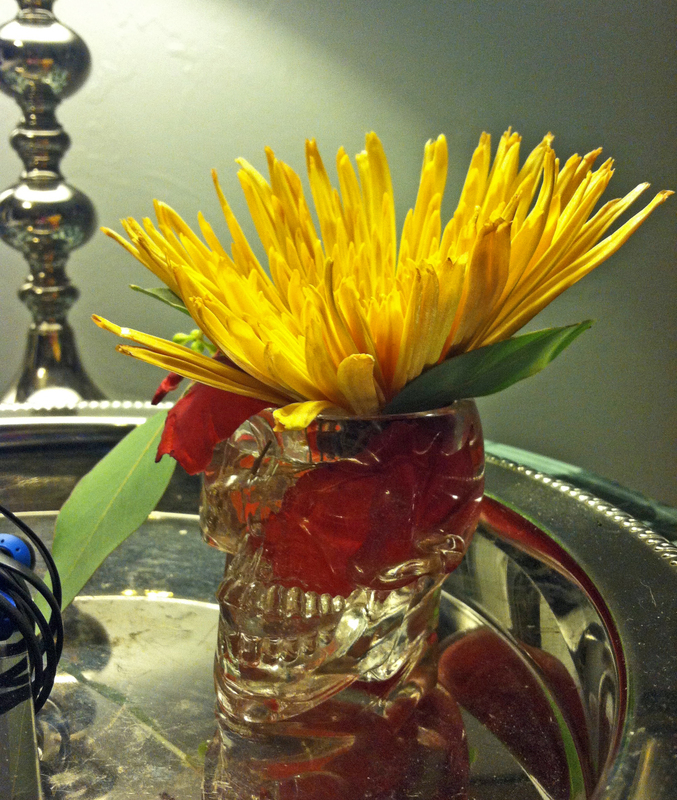 For the dresser vase, I again went with a more high-style arrangement. 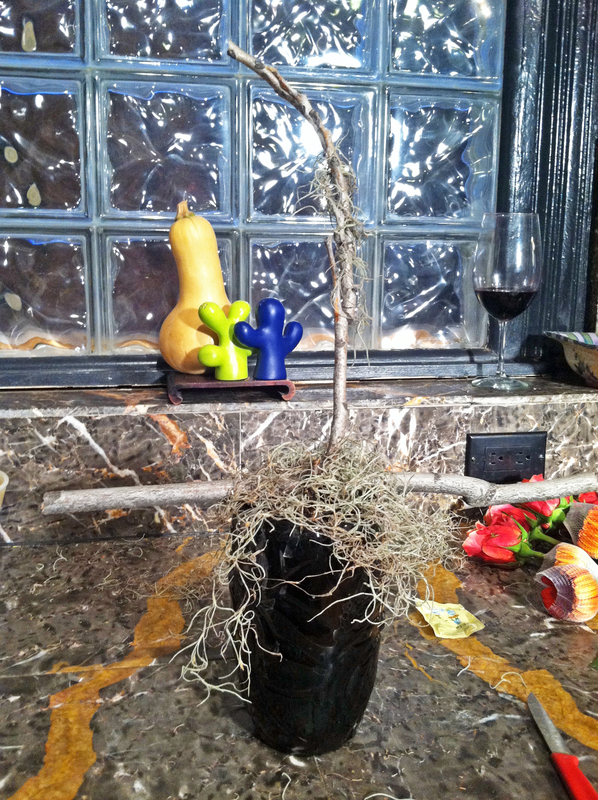 I started with a vintage black ceramic vase, more sticks from the backyard, and our old friend, Spanish Moss. 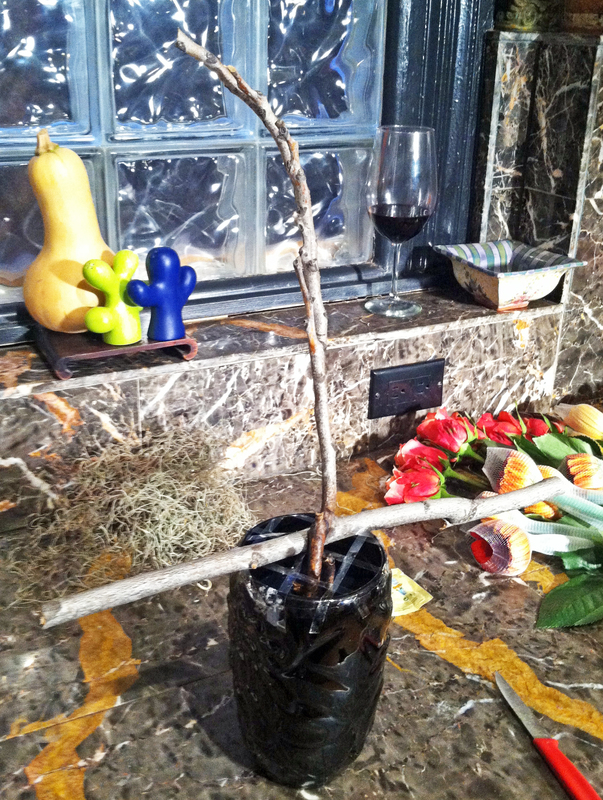 Just like the centerpiece, first I taped off the vase, then played with the sticks till I liked the placement and taped them down as well, then tucked in some Spanish Moss. I also wrapped a little moss around the end of the horizontal stick. 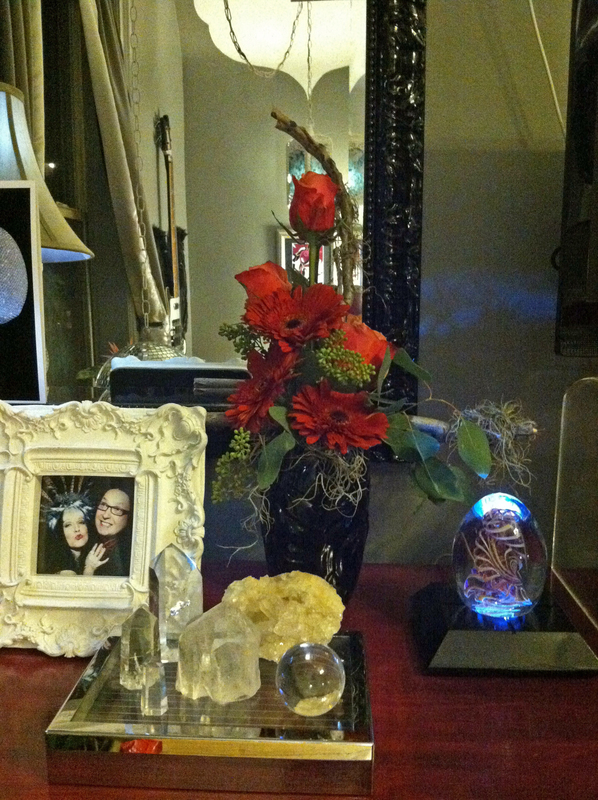 Then it was time for a little green (more of the Seeded Eucalyptus) and the flowers, 3 roses and 3 Gerbera daisies, placed following the height of the stick in a triangle shape. 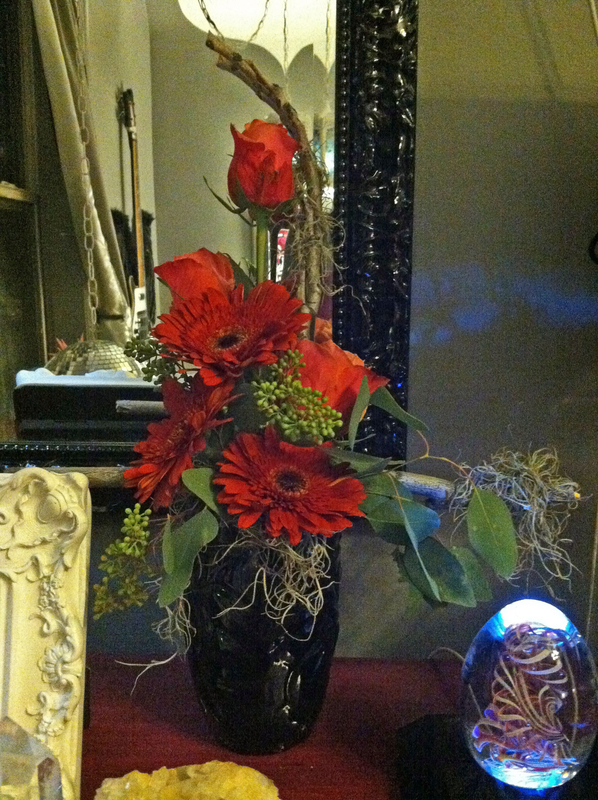 (This is a one-sided arrangement so I could get away with fewer flowers. Because it will be against a wall it only needs to look good from the front.) Yes, that’s a glass of wine in the background. That’s just how I roll. 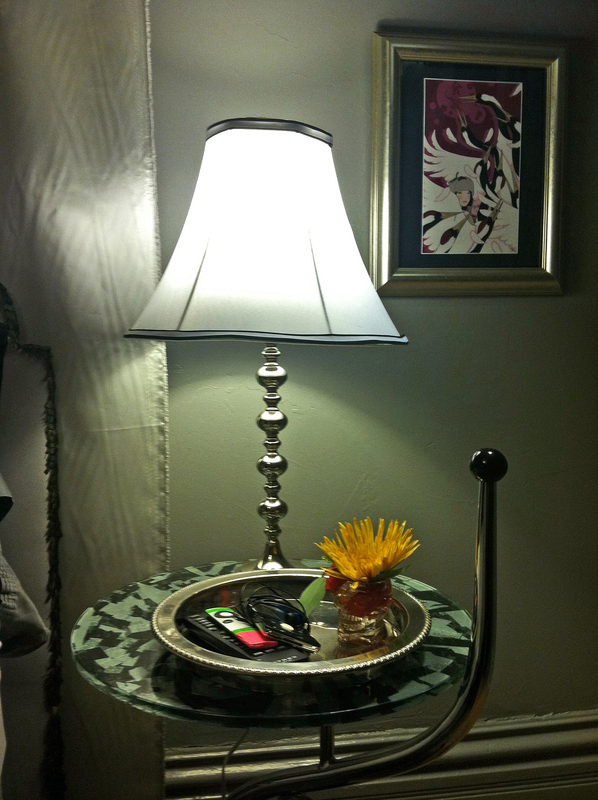 The final three are a small one for the coffee table and two tiny ones for the nightstands. 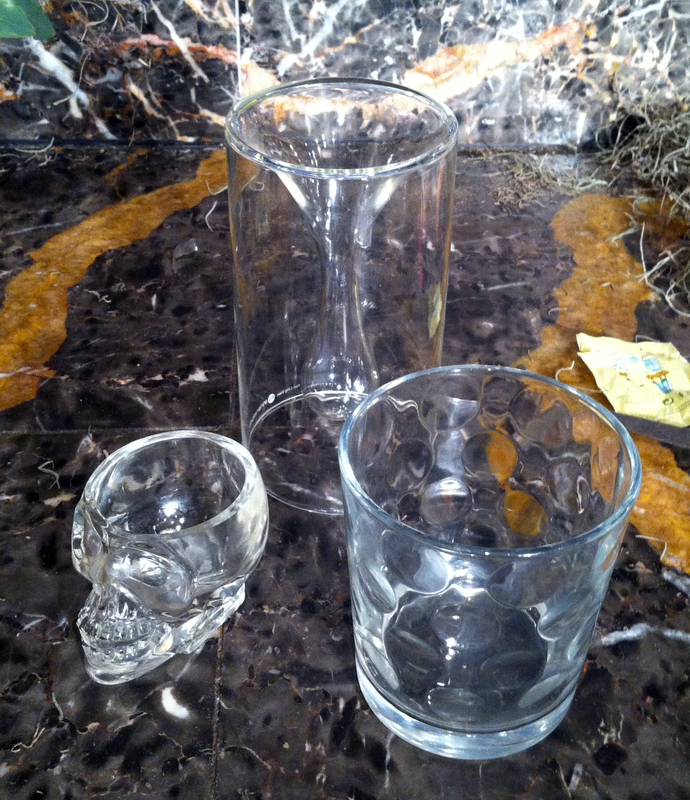 Here I picked out a couple unusual containers, including a glass skull shot glass and a simple short drinking glass. The bud vase is part of a pair I snagged for $2 each at a museum sale. First I taped off the larger one, then added the last of the seeded eucalyptus to all three, plus one more small stick to the largest of the three. 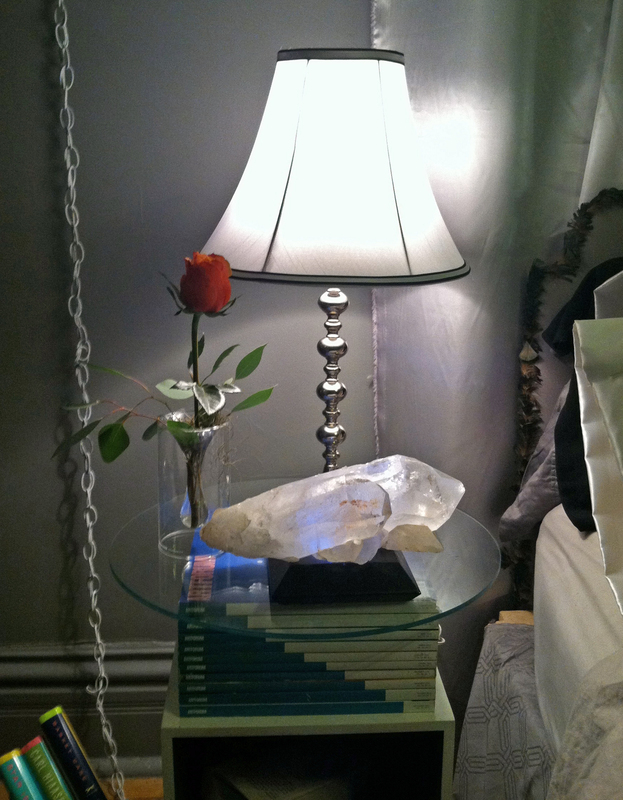 I kept the bud vase simple with a single rose and a touch of Spanish moss tucked in. The tiny shot glass got a single spider mum and a few rose petals in the water for added color. 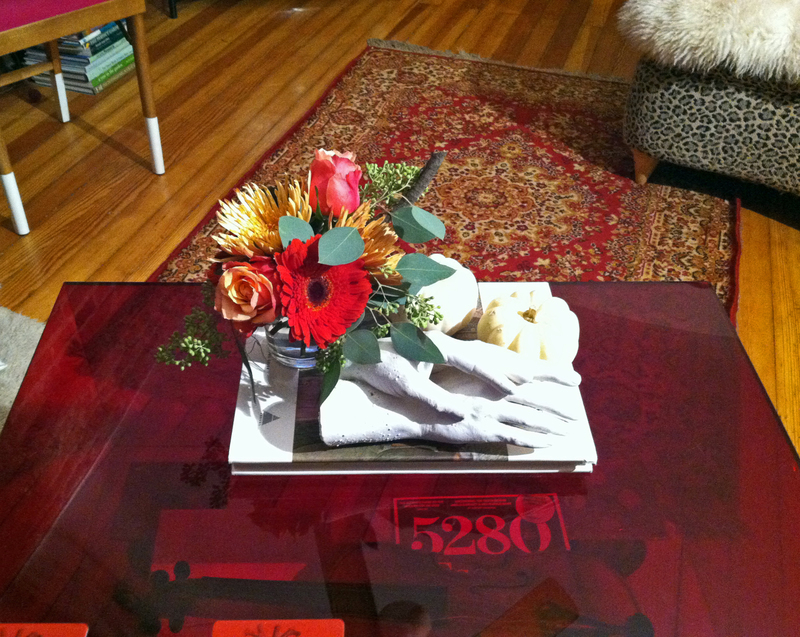 And finally the coffee table arrangement was made up with 2 Gerbera daisies, 3 roses and 3 Spider mums. I kept it low as this fits the space. 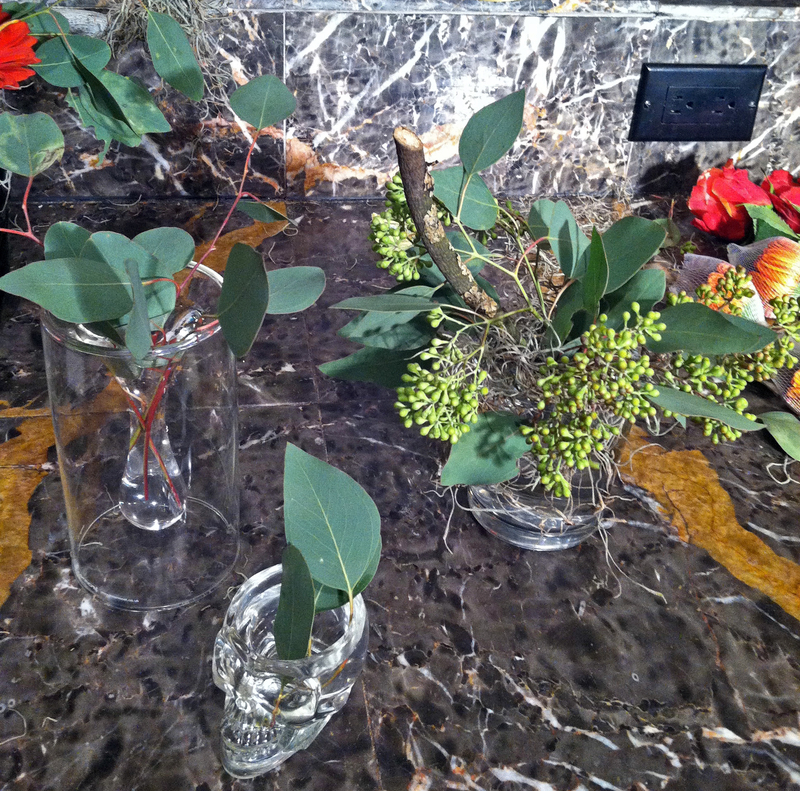 Be sure and change the water in your vases as often as possible so they will last longer. Have a wonderful and beautiful Thanksgiving! 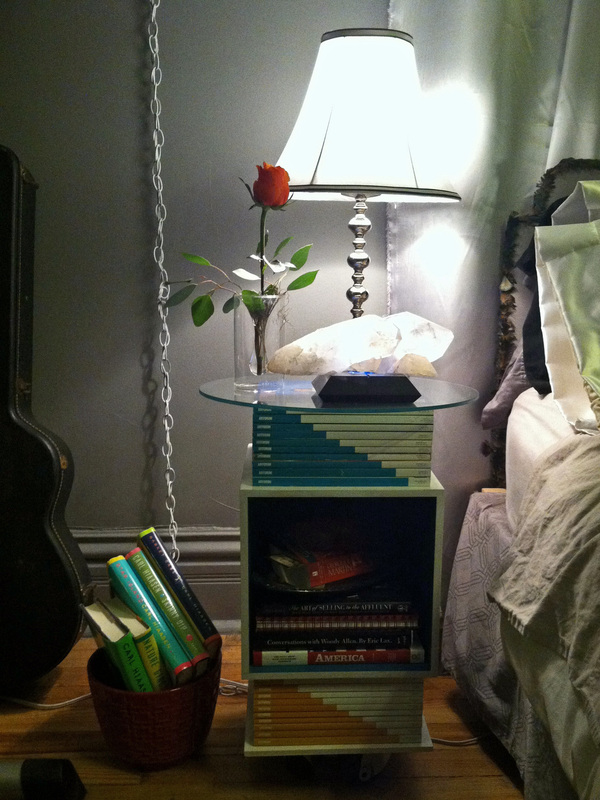 (See the Art Magazine Nightstand Project HERE, and the Industrial Coffee Table Project HERE. 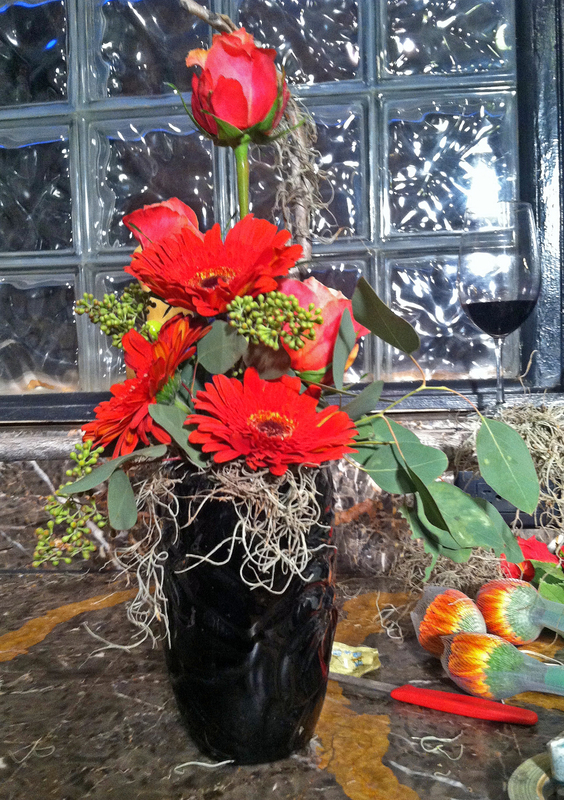 This entry was posted in decorating, Denver, DIY, Flowers, home, lifestyle, Thanksgiving and tagged cheap Thanksgiving centerpiece, Cherry Creek Whole Foods, Denver, DIY, Fall centerpiece, Fall flower arrangement, Fall flowers, floral, flower arrangements, flower arrangment, flower budget, flowers, flowers on a budget, fruit and flower arrangement, Spanish moss, Thanksgiving centerpiece, Thanksgiving flowers, Whole Foods. Bookmark the permalink. 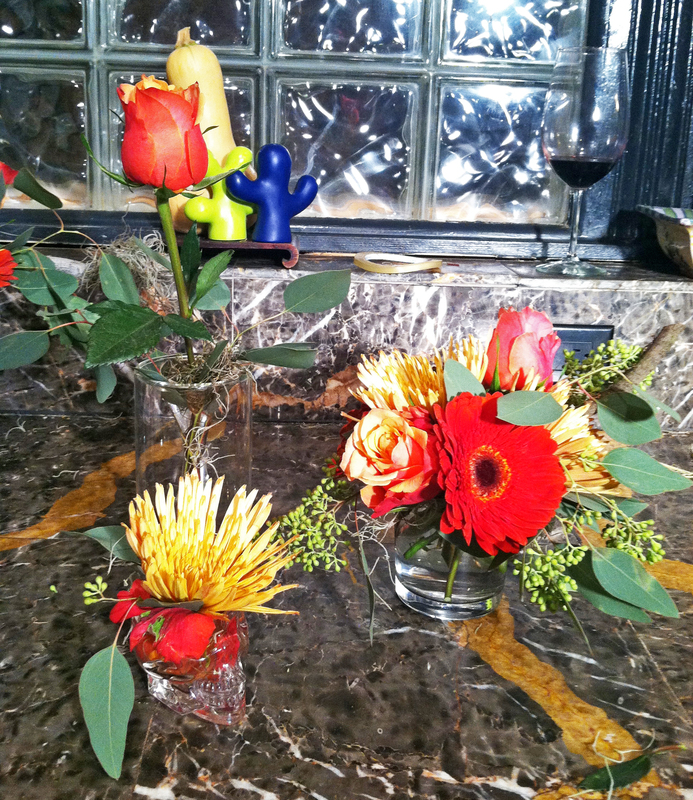 ← How I got 5 Flower Arrangements for Thanksgiving out of $38 worth of Grocery Store Flowers. 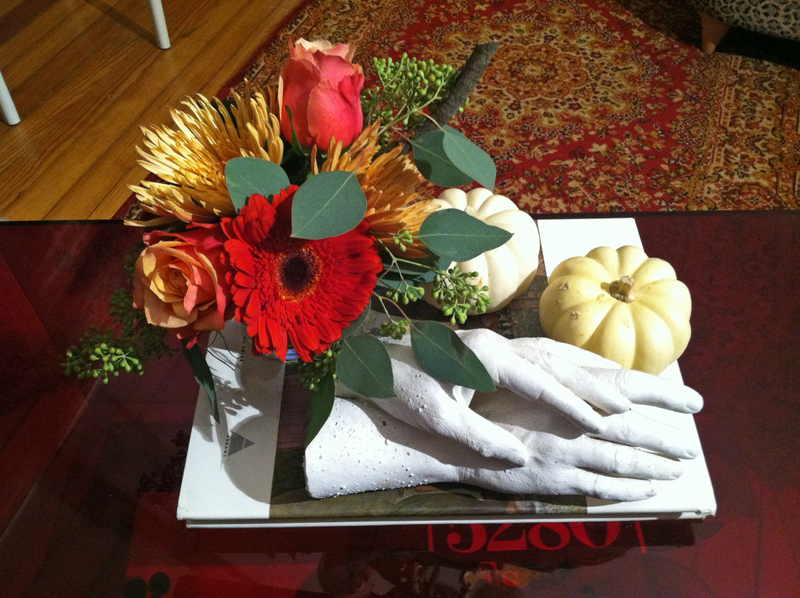 A Fresh DIY Story, Part 1: the Centerpiece.